High performance liquid filter bags for industrial filtration applications from York Fluid Controls are offered in many sizes, materials and finishes. The York 500 Series Liquid Filter Bags are high performance filter bags constructed of Polyporpylene melt blown microfibres, allowing for very fine particle capture at high efficiencies. All York 500 Series Liquid Filter Bags are over 95% efficient at their suggested micron rating. The unique multilayer liquid filter bag construction makes this filter an easy to use, convenient, high performance alternative to filter cartridges. The York 500 Series Liquid Filter Bags contain over 32 square feet of usable filter media. This compares to only 4.4 square feet for most liquid filter bags and only .65 square feet for most cartridges. These high performance liquid filter bags are typically run to 35 psid before change outs. All York 500 Series High Performance Liquid Filter Bags are over 90% efficient at their suggested application rating. The filters are rated using a challenge of AC Test Dust in water, and a controlled flow rate up to 10 GPM. Efficiency data represent initial efficiencies only. The York 500 Series High Performance Liquid Filter Bags can also absorb unwanted trace oils that frequently occure in processed fluids. The high amount of surface area due to the Polyporpylene microfiber construction, results in oil holding capacities from 15-25 times the filters own weight. The York 500 Series Liquid Filter Bags complies with the FDA regulations governing food and beverage contact. 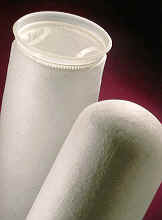 The York 500 Series high performance liquid filter bags are available in the standard size “2”. The liquid filter nags are made from pure polypropylene and are free of potentially damaging silicone oils.